A lot more goes into designing a sprinkler system than meets the eye. As you get involved in the design process, you may encounter new terminology and issues that you weren’t expecting. Here, professional contractors demystify the process to help you confidently understand your sprinkler system design. Zoning plants and lawn areas on the same valve. They have different watering requirements and it becomes impossible to manage water properly. Watering too often, but not long enough to get water down to the roots. This grows lots of weeds, because seeds easily germinate from frequent irrigation, and causes leaf blight and diseased yellow leaves on drought tolerant turf varieties. Too many heads on the line for the sprinkler pressure so that heads fail to pop up all the way, creating dry areas and burn spots. Sun and shaded areas on the same sprinkler zone. Sunny areas dry up quickly and the shaded area becomes a marsh. Water pressure is too high, sprinklers just fog and water blows over into neighbors' yard. 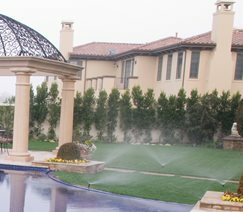 Sprinkler designBefore your landscape contractor can begin your sprinkler system installation, they need to create a layout plan for the system. 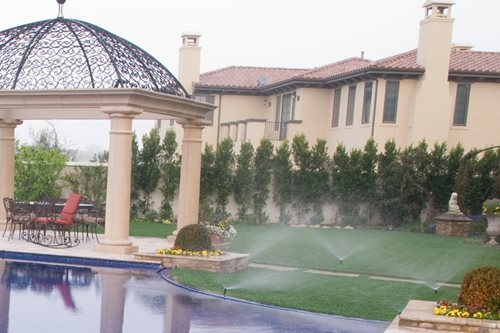 “The first step in designing a sprinkler system is to visit the site, take pressure and flow readings, and check out the soil, slope and other conditions,” says Andy Villaescusa of A-Plus Sprinkler and Landscape in Crestline, CA. Your landscaper may also need to contact the city to ask about water regulations. “Many cities have restrictions in place saying you can only water on even or odd days, and it’s important to pay attention to that,” says Jeremy Walla of Aspen Ridge Lawn and Landscape in Rapid City, SD. Troubleshooting and tipsAvoid overspray. When sprinklers spray past the boundaries of the lawn onto patios or pathways, water is wasted due to runoff. Overspray can also create a safety hazard, since a consistently wet pathway can grow slippery from moss or algae. One of the simplest ways of avoiding overspray is to design your lawn for easy coverage. Walla says that surprisingly enough, squares and rectangles are the easiest shapes to irrigate without overspray. “Even skinny rectangles can be irrigated using boulevard sprayers, which spray in 4’, 6’ or 9’ rectangles,” he says. Don’t use cheap sprinkler heads. “Stay away from sprinklers at big box stores,” says Villaescusa. “They offer a temporary savings, but they just don’t last.” Walla adds, “When choosing a brand of sprinkler, we look for quality of craftsmanship, warranties, and support. Do they hold seminars to teach contractors about how to use their products? Do they stand behind the quality?” It’s worthwhile to spend a little extra to ensure your system actually works. Pro Tip: Use pop-up sprinkler heads in both lawn and planter areas along walkways to reduce tripping hazards. The secret to good water management on any landscape, either residential or commercial, is to design the sprinkler systems into separate zones. Each "zone" will operate via its own sprinkler valve and allow control on just this one area, independently of the rest of the irrigation system. Most irrigation controllers will operate only one valve at a time. Sunny and shady areas should have separate zones because their requirements for watering frequency are different. Careful advance planning will avoid over-watering a shady area or under-watering a sunny area. A well designed sprinkler system goes hand in hand with good landscape design and plant selection. It is equally important to zone plantings by their irrigation requirements as it is to separate sun plants from shade plants. Be prepared for a rise in your water bill. “For a one-acre property with lawn and beds, your water bill may jump $100-200 per month,” says Walla. If this is of concern, your landscaper should be able to estimate how many gallons the system will use each month, and you can calculate the cost based on the rate your city charges per gallon of water. Install sprinklers with the rest of the landscape. Sometimes budget can get in the way of doing everything at once, but when your landscaper has everything dug up, it’s the perfect time to trench and install irrigation. “Clients are often surprised to learn that in an existing landscape, installing a sprinkler system involves digging things up,” says Walla. “In addition to installing the system, we have to re-sod or seed the parts of the lawn where we trenched, and fix up any garden beds.” A good solution for a stretched budget is to install the pipes and just cap them off. Then you can have your landscaper come back and finish the job later with a minimum of fuss.